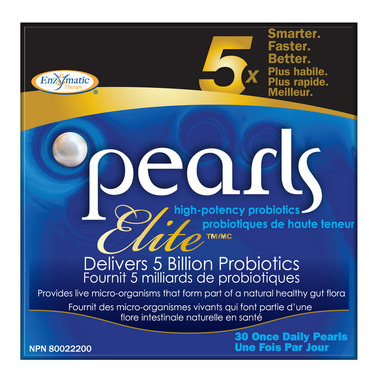 Enzymatic Therapy Pearls Elite are high-protency probiotics that are 5x smarter, faster and better than your average probiotic supplement. Enzymatic Therapy Pearls Elite delivers 5 billion probiotics per capsule to provide live microorganisms that form part of a natural healthy intestinal flora. Beneficial probiotics can help you get relief from occasional gas, loose stools, constipation, sensitive stomach and lactose intolerance. Warning: This product has come into contact with fish, soy, and milk. Do not use this product if you have an allergy to fish, soy or milk. Discontinue use and consult a health care practitioner if symptoms of digestive upset (e.g. diarrhea) occur, worsen, or persist beyond 3 days.